My card today features Scene It - Cow Trio! Just a fun card to put a smile on someone's face. If you like silly images of cows, hurry over to Bugaboo Digi Stamps and enjoy yourself! I love silly images of cows and I love Bugaboo! I recently printed up all the Bugaboo I haven't colored yet. Then I'll go get more! This is so darn cute and I love the sentiment! Good morning Tammy. Lovely fun card and great sentiment. Gorgeous! I like that shade of yellow and the black just makes it pop. Seriously, you could go from crappy to fabulous in a matter of seconds with this card! I love the ladybug making the one cross-eyed...adorable!! 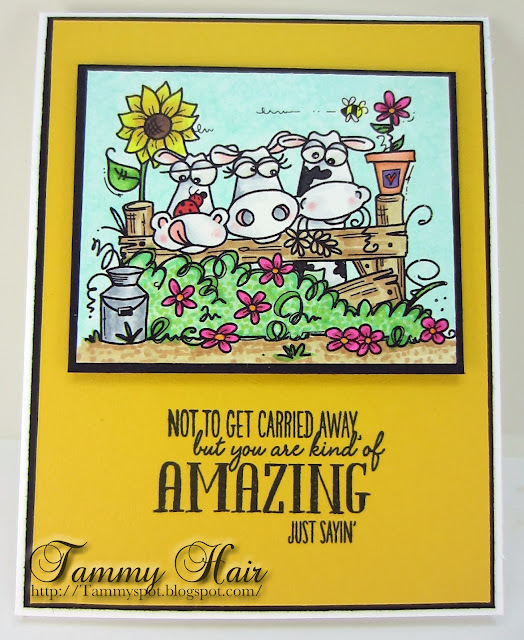 Big hugs to you Tammy! Certainly made me smile! I love the fun image and wonderful colours. Lol! Love it Tammy! Happy Labour Day! This just brightened my day! So cute! Too cute for words!!! LOVE IT! Hee Hee...so cute..what a fun image Tammy..